In November Glasfryn Seminars played host to Border/Lines, a group of poets and academics who come together to discuss literature, critical practice and theory and to explore links, differences and new approaches to an understanding of their relationship. The ethos of the Borderlines meetings is one of openness and spontaneity, the structure of the gatherings is partly improvised on the day, although on each of the two first meetings a theme or a text was mooted as a point of attack, and people were asked to prepare and share material in advance. At Glasfryn the chosen text was Maurice Blanchot’s essay The Gaze of Orpheus, and people were asked to respond to this and to the general theme of the Orphic myths. The day commenced with a paper around these topics, by Lyndon Davies, and the rest of the morning and part of the afternoon was given over to discussion. During the morning, artist Penny Hallas had created two drawings for the Border/Lines event in her studio upstairs, and people were taken one by one to the studio to record their pre-prepared responses to the Blanchot essay to camera. 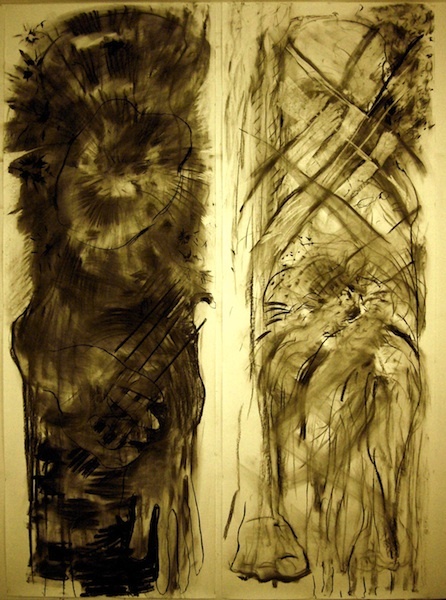 After each reading the guest was invited to sign both drawings, one with a rubber and one with a piece of charcoal. When everyone had done this, people came together to improvise written responses to the day, creating brief sentences and word-patterns which were then torn in half, each part of the sentence acquiring a response and a completion by another of the participants. 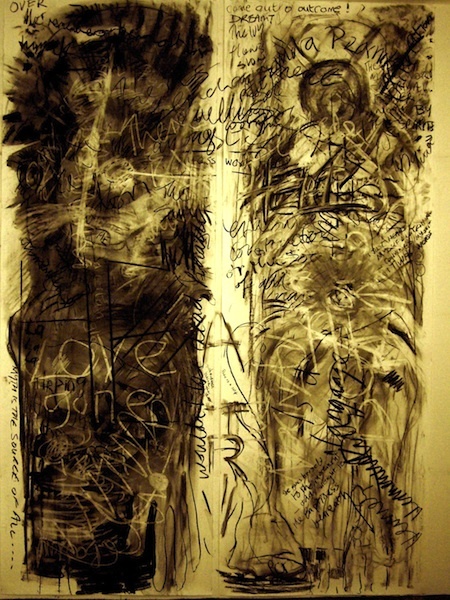 Armed with these reconstituted sentences the participants returned to the studio where, with the use again of rubber and charcoal, they performed a mass intervention on the drawings. The day was documented by use of audio and filmed recordings, as well as by individual written texts which have been uploaded onto a Wiki Site. And, of course by the drawings which bear the marks of the event. Exchanges and responses to the day continue on the Wiki Site site.